Having a cigarette while drinking may reduce the effects of the alcohol, scientists suggest - but the tests have only been carried out on rats so far. Researchers in the US state of Texas blood-tested rats after feeding them varying doses of nicotine and alcohol. They believe lower alcohol levels found in "smoking" rats are explained by how alcohol is absorbed into the blood. 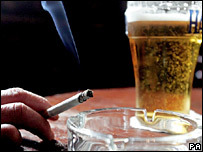 But if the same is true in humans, they warn it means smokers are likely to drink more and suffer related problems. Writing in the journal Alcoholism: Clinical and Experimental Research, the scientists explained their theory on why the level of alcohol in the rats' bloodstream fell as their nicotine level increased. They believe the effect may be occurring because nicotine somehow delays the movement of alcohol into the intestines - a major site for the absorption of alcohol into the bloodstream. While being held in the stomach, the alcohol molecules are metabolised, leaving less alcohol to pass from the stomach to the intestines and into the blood. Wei-Jeun Chen, lead researcher and associate professor of neuroscience at Texas A&M Health Science Center, warned that smoking and drinking often go together. He said: "Since the desired effect of alcohol is significantly diminished by nicotine - particularly among heavy or binge drinkers such as college students - this may encourage drinkers to drink more to achieve the pleasurable or expected effect. "In other words, cigarette smoking appears to promote the consumption of alcohol." Susan Maier, health administrator at the US-based National Institutes of Health, said the breakdown of the alcohol could lead to increased levels of toxic alcohol by-products in the body. She said: "This would be particularly harmful for adolescents and young adult drinkers, since these populations are amenable to this type of drinking pattern, and may develop chronic alcohol-related diseases earlier in life because of it." Dr David Ball, a senior lecturer at the Institute of Psychiatry in London, said: "This is a really interesting study. I'm surprised nobody has done it before. "Obviously, this is a rat study rather than a human study. The most important thing would be to see if this holds true in humans, then we need to see what the implications are."